Fork Mounted Bucket - Normally, when companies are evaluating all their expenses and want to reduce overhead, purchases of machines and unnecessary machine rentals are possibly the first things to be removed. A lot of construction companies feel that loaders have become a cumbersome expenditure and lots of their jobs can be completed utilizing the versatility and effectiveness provided by forklift buckets. A forklift bucket can be purchased for much less than it really costs to rent a loader for a couple of months. It can transform your extendable reach forklift into an effective loading piece of equipment and material handler. This setup would provide better range as opposed to usual loaders and have more flexibility in general. Accomplishing tasks such as placing gravel on a large, flat roof to dumping trash into a dumpster can all be quickly and safely done. There are different forklift buckets available designed for certain applications. 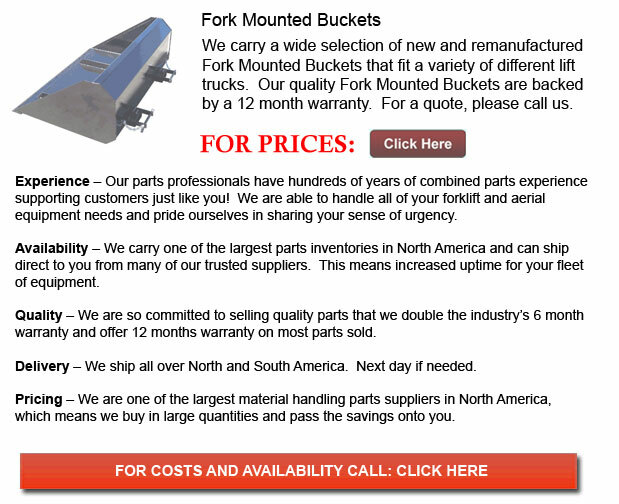 Universal Fit buckets likewise go by the name "slip-on-the-forks" forklift attachment buckets. These buckets can be utilized along with any make and model of extendable reach lift truck. If your unit can't be matched with a quick-tach component, another brand new or second-hand universal fit bucket could be located in its place. Standard universal forklift buckets attach to forks that are up to 6" wide and are 48" long. Larger fork pockets can be ordered via an account executive upon request. For the reason that they slip directly onto the forks, universal fit buckets stay on the machine and are a lot less at risk to damage. As opposed to the quick-tach bucket models, universal fit buckets are fifty percent. This additional room makes them perfect for lifting irregular shaped loads like broken up concrete, backfilling behind walls, tearing off roof trash, elevating roof gravel and moving large debris piles. Also, made as attachments used for extendable-reach lift trucks, Quick-Tack buckets, are made to allow the placement of materials far beyond the standard reach of the loader. A hardened beveled cutting blade on the leading edge and on both sides reinforces stability, resistance to wear and offers supreme durability. Quick-Tach lift truck buckets are augmented by scuff bars along the base of the unit which protect it from scrapes. Quick-Tach lift buckets can in various situations replace the forks and carriage of a lift truck, that may weigh anywhere between 100-700lbs. These buckets when set up can free up more load capacity, enabling it to handle both larger and heavier things. The Quick-Tach is able to dump items more or less 1.5 feet higher due to the shorter depth of its bucket. These buckets are fabricated in a custom fashion in order to suit all the specifications of certain models and makes of lift trucks. It is essential to consult a construction equipment specialist so as to find the custom-made Quick-Tach bucket solution for all your requirements. Lift truck bucket accessories are great for construction work on the ground level. They could be used to transport snow in the northern regions, gravel and even sand. Clean-up on the job location can be likewise be completed with a forklift bucket. The numerous purposes the bucket can accomplish saves the business much time and money because it does need to absolutely switch tools or equipment and this can help prevent running into overtime.